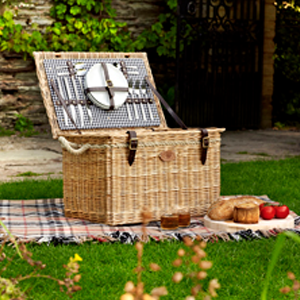 Our range of Picnic Hampers have been carefully hand worked and formed with that typical Summers day in mind. 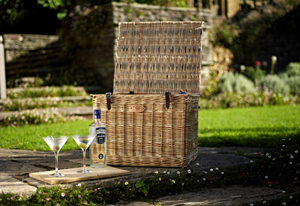 Subtle, yet striking in appearance, our Picnic hampers are practical, elegant and hard wearing. The company's full collection of Somerset picnic hampers have been showcased on our British Country Range and include among many the ‘English Afternoon Tea Basket’ for that picturesque cream tea, the clever ‘Chantilly Wine & Cheese Basket’ with its unique front opening door and the rather large and grand ‘Ascot Hamper’ for that special day out at the races. All of our hampers and picnic baskets come with backboards covered in a variety of different material coverings, which include; Tweed, Gingham and Navy Blue cotton. Holding our picnic basket lids into place, is a neatly cut length of strapping which extends from the base of the basket to the lid. The lid is tied down into place using strips of leather strapping which act as the baskets main hinge. The lid is secured and closed using large leather strap and buckles. To finish the basket, a natural stamped leather badge with The Somerset Willow Company name and logo is positioned on front face of the basket to reinforce our commitment to maintaining the highest possible quality and standards. Customers wishing to fully furnish our picnic hampers should take note of the following information. All partition, internal basket and glass basket sizes displayed are subject to a +/- tolerance of 6mm please also note that free space inside our picnic hampers will be reduced depending on the amount of plates held on the picnic backboard. The plate diameter displayed for the picnic backboards will allow the said displayed quantity of plates to comfortably fit onto the backboard. A reduction of the plate diameter will allow an increase in the number able to fit. An increase in the diameter of the plates will mean a reduction in the quantity able to fit. Glass baskets which accompany many of our picnic hampers have max glass and cup sizes displayed, again these measurements are governed by a +/- tolerance of 6mm.